Work hard, get a few good breaks, drive down the road from your college…Win the Masters. That was Patrick Reed’s dream come true this weekend, winning his 1st Masters Title in his 5th try. While he was en route to victory, a swell group of us just down the road were completing or reliving our own childhood dreams. During my youth, my golf coach, Doug Weaver, instructed me that because of my short stature, if I was going to have any chance of furthering my golf career, I was going to have to put my weight into each swing. The transfer of weight was critical to gaining distance and consistency. At the time of my education, nobody transferred weight through their swing better than the great Gary Player. Doug Weaver had me mimic his swing, using something called the “Gary Player Walkthrough”. I figured, if Mr. Player could use this technique to help him win 165 Tournaments, including 18 Majors, and become South Africa’s “Sportsman of the Century”, it might work for me. This 5’6″ man, Mr. Player, whom I writhed and molded my body and swing to mimic, soon became a large figure in my life. I’m now sitting next to this great man at dinner…at The Masters. The purpose of our 7:47 Club dinner at The Masters was to celebrate the 40th anniversary of Mr. Player’s 3rd Masters Victory. In 1978, Mr. Player completed a 7-shot come-from-behind, shooting a course-record-tying (64) en route to a 1 shot victory. 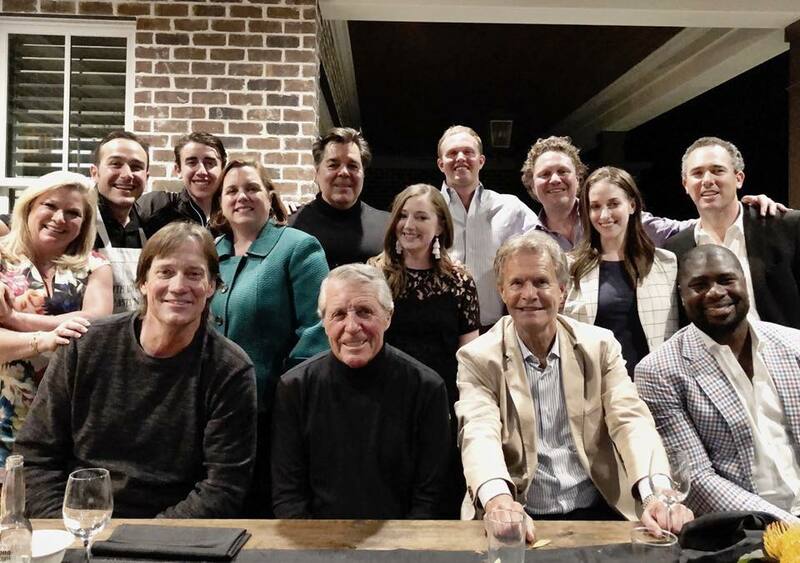 Old friends and new assembled at Mr. Player’s home in Augusta to reflect on a career well played, and a life well lived. We heard him reflect on family, friends, golf, and much more. Our communal discussion topic for the evening was giving voice to people in our lives we wished were around to see our success. It was an amazing topic. Some at the table gave voice to grandparents that they were too young to know. Some gave voice to the grand children they will likely never meet. And some gave voice to themselves, saying that they wished they would appreciate their own success more and appreciate the journey. ‘I became a champion because I knew what it was to suffer’. After the dinner, I read that quote by Mr. Player and created a post-it note of it on my wall. Because of that dinner, I now walk into life’s challenges with more inspiration, wisdom, and proof that if you want to get something done, you can do it. But you’re going to have to work with every bone in your body to get it. For then, it will have been worth it. Thank you, Mr. Player, his son Marc Player, Bo Wood, Gabriel and Madisen for the invitation to perform my life’s work, and your warm hospitality. Thank you to Kevin Sorbo, my fave childhood tv superhero, Hercules, for flying in from Los Angeles. Thank you to Ovie Mughelli, Darrah, Brendan, Sonya, and Marci who drove in from Atlanta.